Hybrid Flamenco reminds me of the movements and colors of Flamenco dancers. 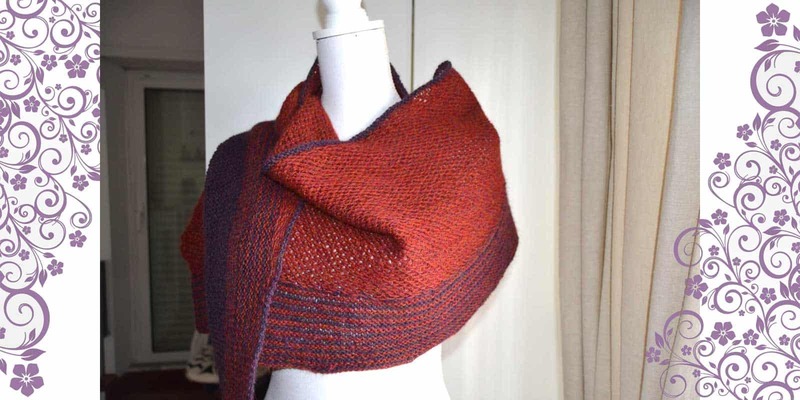 Its winding shape is obtained by joining (that’s why “Hybrid”) two shawl constructions: the semicircular shape and the triangular one. 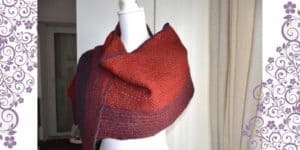 The unusual construction of this shawl, together with its simple texture, makes it a versatile accessory easy and interesting to knit. 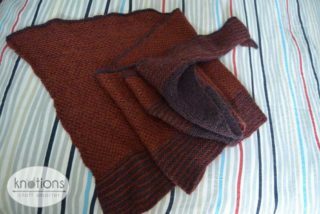 The shawl is adjustable for any gauge and yarn; this will affect the dimensions of the finished object and the amount of yarn used. 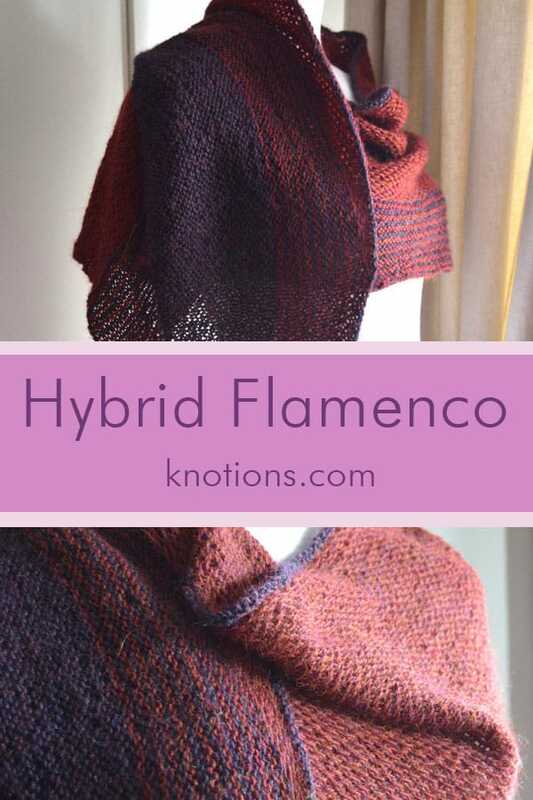 Hybrid flamenco has an unusual construction. 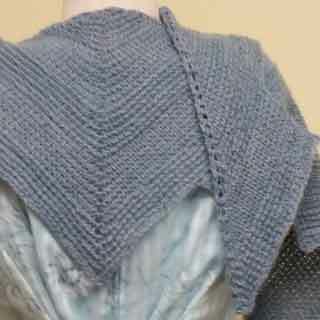 It starts as a crescent shaped shawl, then new sts are cast on at one edge of the crescent to start building the triangular part, which is then shaped with short rows. Row 1 (WS): *K1, sl1 wyib, repeat from * to last st, k1. Row 2 (RS): Knit to the end. Row 3: K2, *sl1 wyib, k1, repeat from * to last st, k1. Row 4: Knit to the end. With MC, CO 8 sts with long tail cast on method. K1, kfb 6 times, k1. You now have 14 sts. Row 1: K1, kfb, knit to last 2 sts, kfb, k1. Repeat row 1 another 49 times until you have 114 Sts. 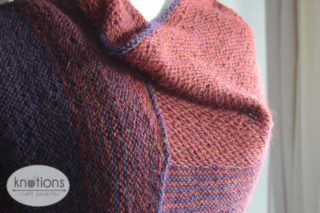 Change to CC (do not cut MC) and knit row 1 from above (2 increases). At the end of the row, don’t turn but pm, cast on 200 sts with backward loop method; 316 sts. 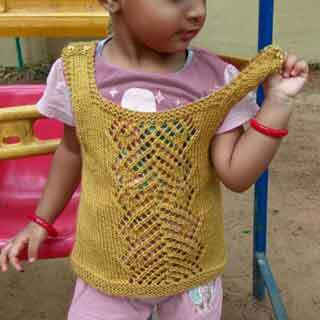 Turn, knit to m, rm, k1, kfb, knit to last 2 sts, kfb, k1 (2 incr). Change to MC for next section. 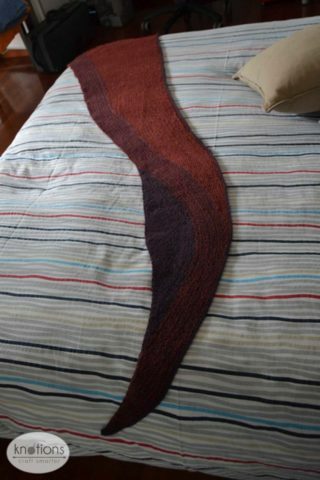 Row 1: K1, kfb, knit to the end (1 incr). Row 2: Knit to last 2 sts, kfb, k1 (1 incr). Change to CC, repeat last 2 rows. Change to MC, repeat last 2 rows. Repeat last 4 rows seven more times (352 sts) alternating MC and CC every two rows (one garter ridge). With CC, starting from the other edge of the work (WS) work stitch pattern over 17 sts. Turn. Ds, knit to the end. Next Row: Work stitch pattern to ds, kds, work stitch pattern for 7 sts. Turn. Next Row: Ds, knit to the end. 307 sts rem on right needle when RS facing. Work stitch pattern to ds, sl st, work stitch pattern for 5 sts. Turn. Ds, knit to the end (when you get to the Ds, knit both sts of it together as one). Work stitch pattern to ds, sl st, work stitch pattern for 3 sts. Repeat last 2 rows 69 more times . Work stitch pattern to 4 sts before last ds. Turn. Pds, knit to the end. Work stitch pattern to 2 sts before last ds. Repeat last 2 rows 4 more times. Repeat last 2 rows 5 more times. Change to MC and knit 2 rows. Weave in ends. Wet block with pins and blocking board to give the proper shape. 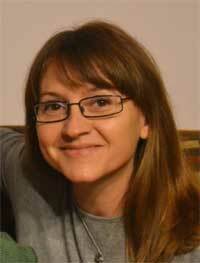 In Stella’s previous life she has been a humanitarian doctor and has worked in a variety of developing countries. 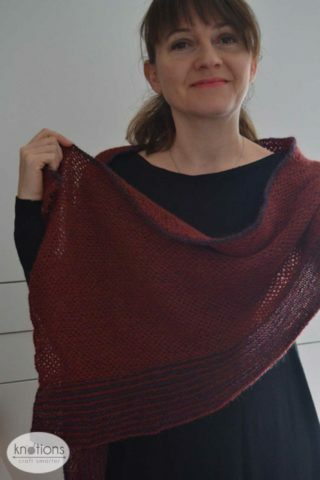 Now, she has put down roots in Rome (Italy) where she enjoys being the busy mum of two young rebels and she relaxes with knitting whenever they leave her free time. Beautiful. Detailed instructions. Like it. Thanks 🙂 I’m so glad you like it. Stella designed a really unique shawl!